2 - 3,4...........Bingo von Ellendonk. 2 - 3,4...........Cona von Niederkassel. 3 - 4,5...........Jago von Beelen. 3 - 4,5...........Palma von Ellendonk. 3 - 4,5...........Satan von Ellendonk. 3 - 4,5...........Blanka von der Au. 17/06/1995: 99-81-85 = 265 points. Ira von der Weyermühle passed her ZTP with 1A rating for character and SG for conformation. She is litter sister to Ilo von der Weyermühle: SchH 3, FH, and passed the Körung at two years of age with highest ratings for courage and working drives (very high protective instinct, fighting spirit and courage, high hardness and middle sharpness). Ilo in turn is sire of the vom Blitzkrieger “B” litter (Baron, Bogart, Bo, Bren); von Warringhof “N” litter (Noami); Jotunheim's “H, P, S” litters (Hamlet, Hildico, Hergerd, Pegrim, Signe) and vom Tanzenhaus “A” litter (Angriff, Andie). A repeat combination of the “I” litter also produced Kent von der Weyermühle and IDC-Weltmeister Kleo von der Weyermühle: German Police K-9, SchH 3, FH and passed the ZTP with 1A rating for character and SG for conformation. 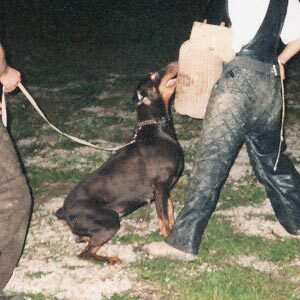 Kleo is dam of the von der Doberwache “A, B, C” litters (Amatzon, Bronco, Bastian, Bingo, Brista, Branca, Biene, Chico).